This kit contains two DVDs and resources that will help you with the shearing process and fibre preparation for best profitability. It is without doubt your best resource. 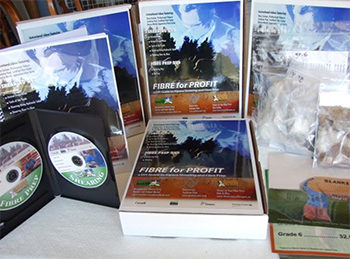 The kit includes one DVD on shearing and one on fibre preparation for processing, fibre samples - grades 1 to 6 and more, laminated charts and posters. Also included is a book with detailed information to help you on shearing day and in preparing your fibre for processing.